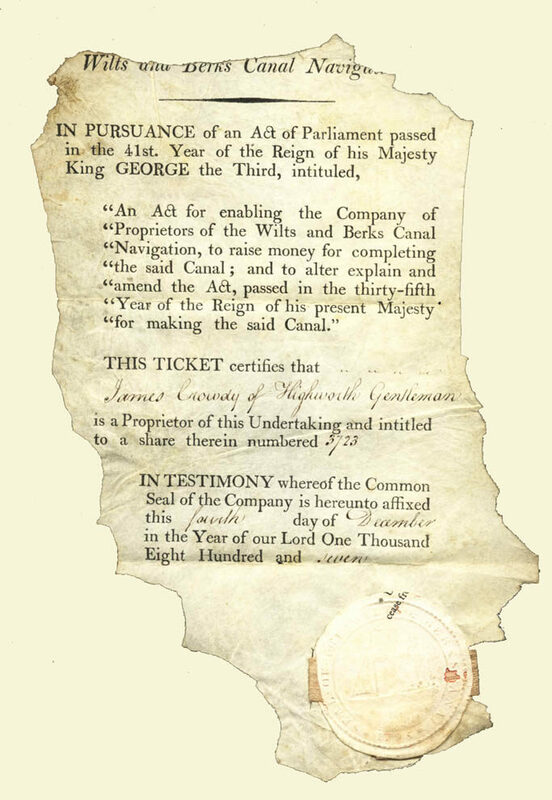 Back from nearly two hundred years of wandering the world comes an original share certificate. In the name of James Crowdy and dated 4th. 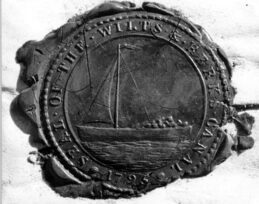 December 1807, the certificate is rather tattered around the edges but all the text is complete as is the original paper seal. The Crowdy family were involved with the canal for many years, (see Jack Dalby's book). This document has come back to us thanks to the generosity of Noelle Pelot who lives in Wisconsin, USA. Noelle acquired the certificate twenty three years ago, from a friend, with a collection of postage stamps. Noelle thinks that it was picked up in Germany by the friend's father after WW I as it was tucked into some German post WW I coupons. Out of curiosity Noelle searched the Internet for the Wilts & Berks Canal, found my site and after a short correspondence kindly sent me the certificate.